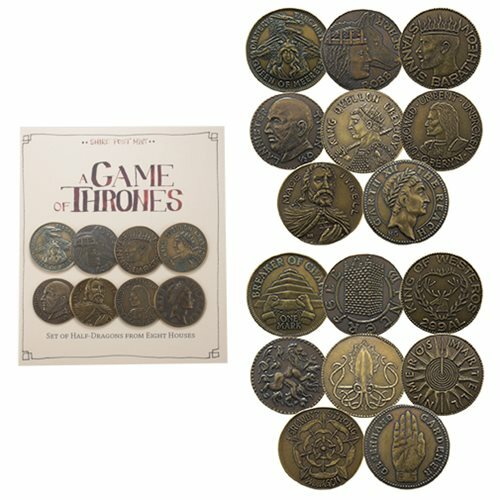 Golden coins for some of the major houses of Westeros. A set of Half-Dragons struck in brass featuring the following characters: Daenerys Targaryen, Robb Stark, Stannis Baratheon, Tywin Lannister, Oberyn Martell, Mace Tyrell, Quellon Greyjoy, and Garth Gardener. They feature a unique depiction of the character along with their house's sigil. Each coin is made one at a time in the USA using antique coining equipment and traditional techniques. The set comes with an information sheet with details on each coin and character.? Officially licensed A Song of Ice and Fire merchandise. Ages 15 and up.